Let me tell you, I’ve always been amazed at people that can make meals from scratch. Somehow, the thought of just throwing stuff together and hoping that it turns out has always terrified me…but that’s not so much the case any longer. You see, I have four boys – and aside from one on a very special diet – they will eat anything. And lots of anything. Lots and LOTS of anything. Yesterday I started what was to be supper last night, but Boss Man surprised me by having put something in the oven for supper already. So I saved it for today (which actually made it healthier). This post is actually two recipes in one, so be sure you read all the way to the end, you don’t want to miss it! Put all together into a stock pot or kettle with water. I filled my kettle about 2/3 full of water. 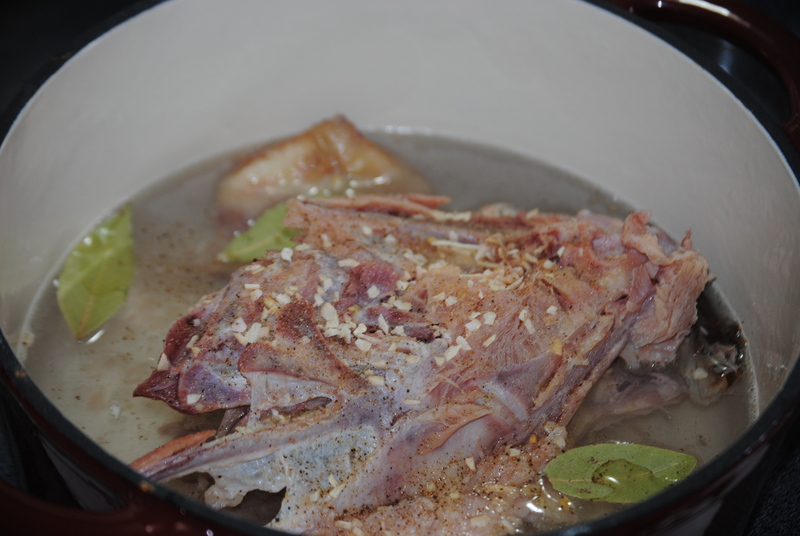 It depends on how strong you want your broth, how much you’re going to need for the final recipe, etc. Turn the temp up to medium and bring it to a boil. Keep it boiling for 30-45 minutes. The longer it cooks, the more flavor you’ll draw out. 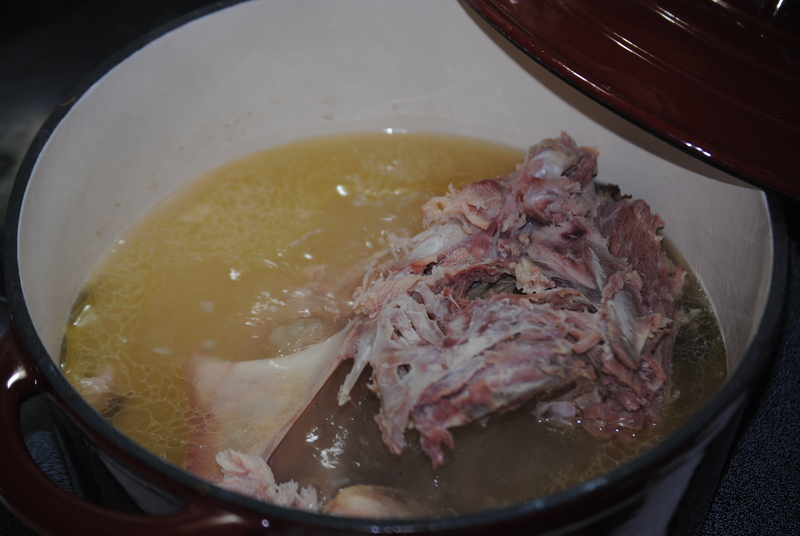 As the meat starts to fall off, you’ll know when it’s about done. Getting ready to make my broth. Notice how most of the meat has fallen off? I picked a little more off as I was pulling out the bones. If you’re making soup that day, just add your other ingredients and enjoy! If your soup-making day is a little ways off, place the broth in the fridge and let it cool. If you let it cool first, all the fat will harden at the top, making it easy to skim off. If you’re soup seems to be lacking a little something, you can easily play with it, by adding a little extra chicken bouillon, beef bouillon, etc. 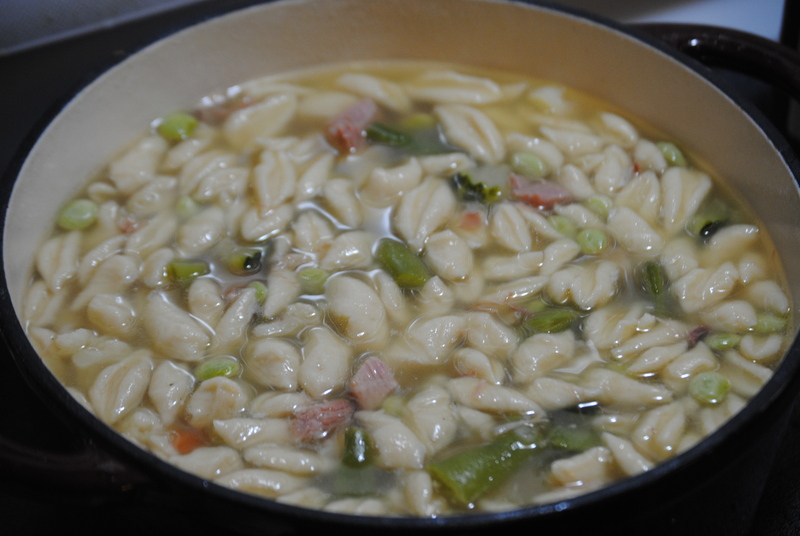 Knephla soup is simply a dough-based soup. Super easy to make, especially with the broth above. 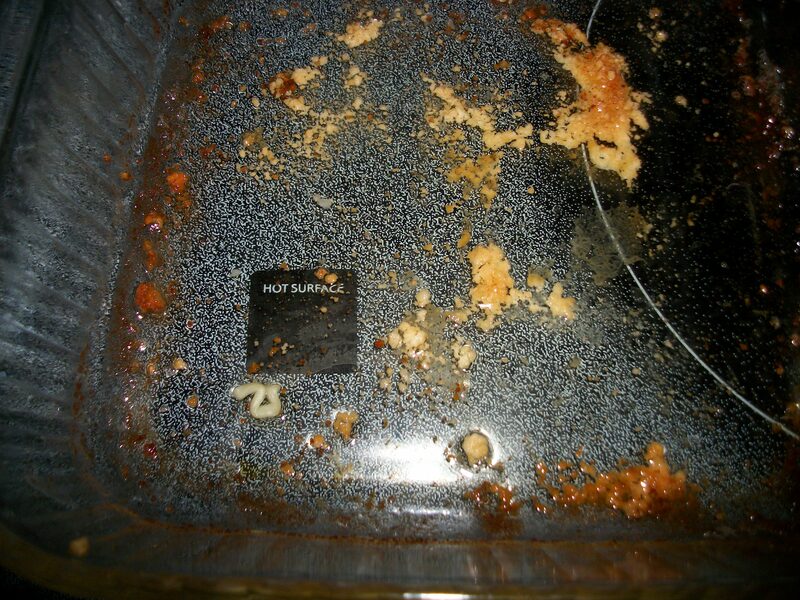 German Knephla Soup – No matter how you spell it, it all ends up the same…GONE! One Final Story…and a Winner! Next month, it will be 3 years since I was diagnosed. I was having problems with the vision in my left eye…seeing spots, flashing lights …and I noticed one morning that I couldn’t see out of the top half of my eye. The Dr’s office got me right in when I called. After a dilating my eye, an ultrasound and a few photos, the Dr called me back in to his office and explained it all to me. I just sat there looking at the pictures. My cancer is called Choroidal Melanoma. It’s a form of skin cancer and has attached itself to the back of my left eye. Normally the cancer is caught about the size of a match stick head…mine was bigger than a penny but smaller than a nickel. My eye doctor did not dilate my eyes two years in a row. He just checked my vision for new contacts. If he had of, the tumor could have been caught much smaller that it was. So, when you see your eye Dr., please be sure he dilates your eyes so he can look behind them. The treatment for my cancer was radiation. If… not when…but IF it spreads, I will take chemo. He then scheduled an appointment for me to see an Opthalmic Oncologist in Memphis. . I had to stay at the Cancer Center in Memphis for nine days…I came home the day before Christmas Eve. A radiation implant was surgically attached to the back of my eye and then surgically removed 8 days later. You’d think it would be uncomfortable wearing that thing, but it wasn’t. If I lowered my bottom lid, I could see part of the implant. Other than that, I just had to wear a shield over my eye to keep others from being subjected to the radiation. The radiation kills the tumor over time. I’m going to spare you the photos…no sense in showing you how awful I looked at the time. But I will tell you this…..I got a lot of stares and I scared small children…the stares I could deal with…scaring the children made me sad. So, I made a point to wear a patch if I went out. My eye was inflamed and very blood shot. I see two different Oncologists, (one for my eye, and one to run CT and bone scans to see if the cancer has spread) a Retina Specialist (who gives steroid injections in my eye to help the retina heal….and YES…OUCH!) and a Dermatologist ( to check my skin, since it is Melonoma)…They will be my doctors for the rest of my life…They are all very caring, loving, awesome doctors! To sum it up…I have lost the vision in my eye, I still see a few flashing lights (but nothing like I was), I have to use reading glasses for my good eye and I’ve had surgery to repair my eyelid so I can open my eye better now. And…the BEST NEWS!….the tumor is still getting smaller…and the cancer has not spread! Wooo Hoooo! Yay me! Yay God!!! I told my doctors in the very beginning that I was going to be a miracle patient. I’ve got prayer warriors all over the world praying for me! So far, I have beat the odds on my cancer. I give that credit to God. My doctors are happy to see me each time I show up at my appointment. It could take two more years for the tumor to be completely gone. But, I’m okay with that. I’m alive…and while I’m alive…I will keep living. I have a lot to live for…and God’s not finished with me yet! Once again, I would like to just thank each and every one of you who have invited us into your lives, shared your stories, shared your fears, your pain, your triumphs and your tragedies. It’s been an amazing month for me…and I plan to give back more in the future. 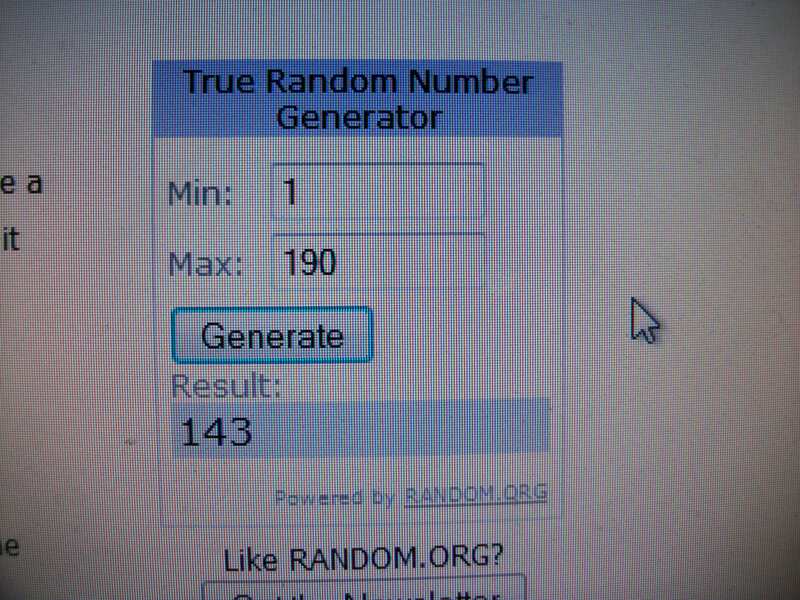 Number selected...143! One of the "extra" entries earned by someone emailing a cancer story to me...and the winner was Rhonda Darbro! The winner of the KitchenAid, and all the accessories is…Rhonda Darbro! Congratulations, Rhonda! Tomorrow starts November, a month of Thanksgiving. Any ideas on what we should do? I’m home from church today, sick. Yet, even on days like these, I count my blessings. Tomorrow at noon, I will draw a winner for my Pink KitchenAid prize pack…I would like to thank EVERYONE who has participated, entered, shared their stories, whatever it may be. On March 7, 2008, my husband’s younger brother got married. 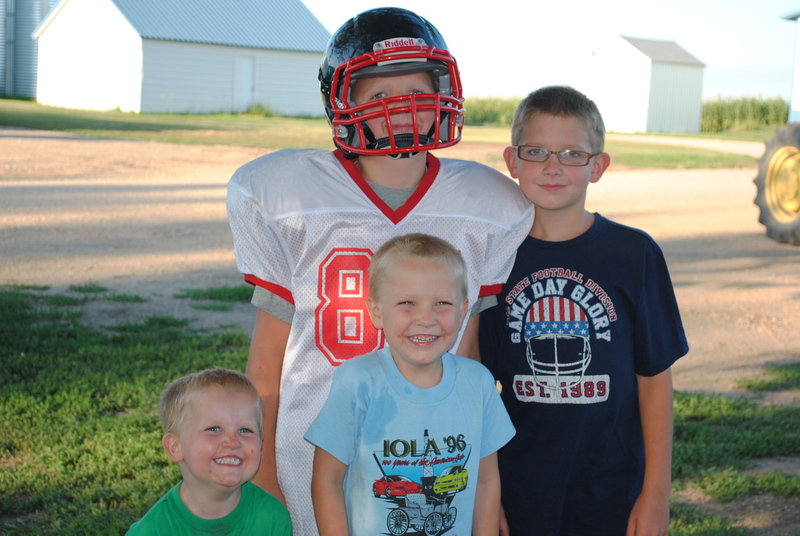 The next day we learned his oldest brother’s wife had lost her battle with breast cancer. Although I never had the pleasure of meeting her, I think of her often. We talk about her, her husband (my husband’s brother), and their two little boys often. Starting last year we run the Liz Hurley Ribbon Run in memory of Tanya. I’ve jokingly told my family that I’ll run it until all I can do is walk and then I’ll have someone push me in a wheelchair if I have to. One day we hope to run it with our entire family. I can’t think of a more fitting way to cherish the memory of someone who went home to God at such a young age. My sister has some cancerous breast tissue removed a couple of years ago and now my other sister has to go back and have another mammogram because something showed up in the 1st one. I don’t know all the medical terms for what they have right now but as soon as you hear the word Cancer you get nervous. I haven’t had a mammogram in 4yrs. I didn’t even realize it was that long. I have been seeing the same doctor too and he never mentioned to me I should get one. So I have an appt. this October to have mine done. It is so important for us as women to take control and get this done. God bless all the cancer patients in this world. her side and said, “I had a colonoscopy today, and they found a mass.” Then she started to cry. She was only 49. I immediately went into nurse mode and started to grill her with questions. She had the colonoscopy done at a different facility, but came back to our hospital to get labs and other tests done, then was going home. I was numb the rest of the day. The next day, I went to Columbus for a Young Farmer conference, and Mom went back to work. Dad called me that evening and said that Mom started to bleed at work, and it wasn’t stopping. She left work(which NEVER happens!) and Dad took her straight to Fort Wayne. They admitted her to the larger hospital, with a colorectal surgeon, and gave her blood transfusions. (One of the biopsy spots failed to clot, which was the source of her bleeding). She was in the hospital a few days, then was released to home. She had a colon resection on September 6, and found out 5 days later they got it all. 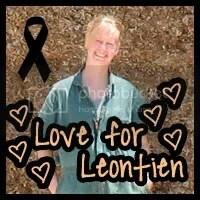 She lucked out, had a great surgeon, and an even greater faith in God. No chemo or radiation. Just frequent checks with her surgeon. So pay attention to your body. It does talk to you. All you have to do is listen, and have faith. Yes…you are so right. All we have to do is listen, and have faith. Tomorrow morning’s post will wrap this month up…and I’ll explain why I did all this. And then, at the stroke of 12 (or close there to), I will draw the name of a lucky winner of this sweet KitchenAid. Good luck to all who entered…and more importantly, good luck to all who shared their stories. May God bless every one of you. 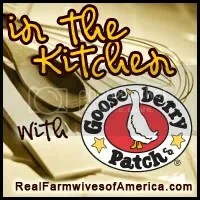 Gooseberry Patch Recipe #7 and a KitchenAid! Last night I was planning on being involved in a great online connecting party with Rockin’ Rural Women…but fate stepped in. 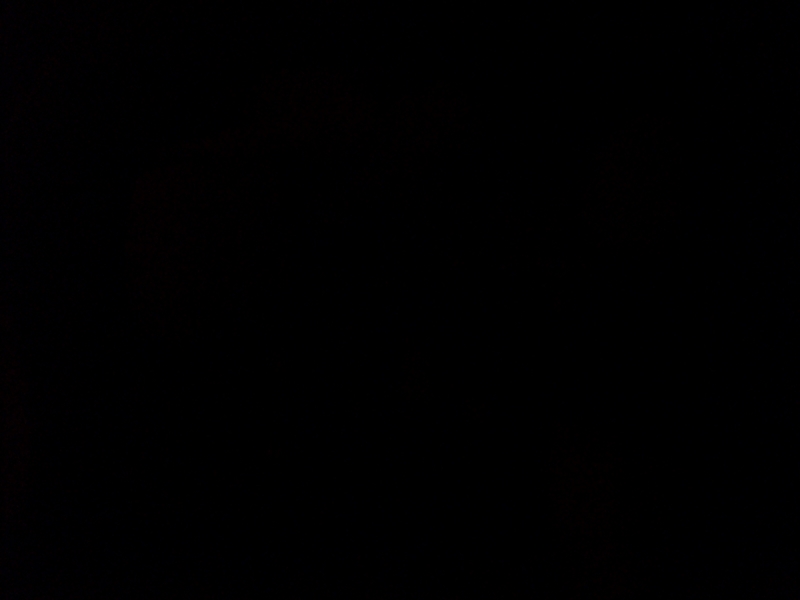 At about 8:20 p.m., our power went out. And it stayed out forever (according to my boys). * Four-year-olds will turn on every light in the house, and then report back that, yes, the light in such-and-such a room is not working either. * For some reason, my boys cannot fall asleep if the power is off. I don’t know why, but believe we should have a federal study regarding this phenomenon. Really, it makes more sense than some of the other things they study. * LeapPads make great flashlights when surprised with a power outage. * Throwing out all my candles when my boys went through a stage of playing with them, was (in hindsight) not the greatest idea I’ve ever come up with. * During a power outage is not the best of time to find out that your children have taken all the batteries out of your flashlights. But, I mean, how else would they power their toys when you refuse to replace dead batteries? I may have to rethink my decisions here. Yes, it was an interesting, exciting and quiet evening. But we got through it. 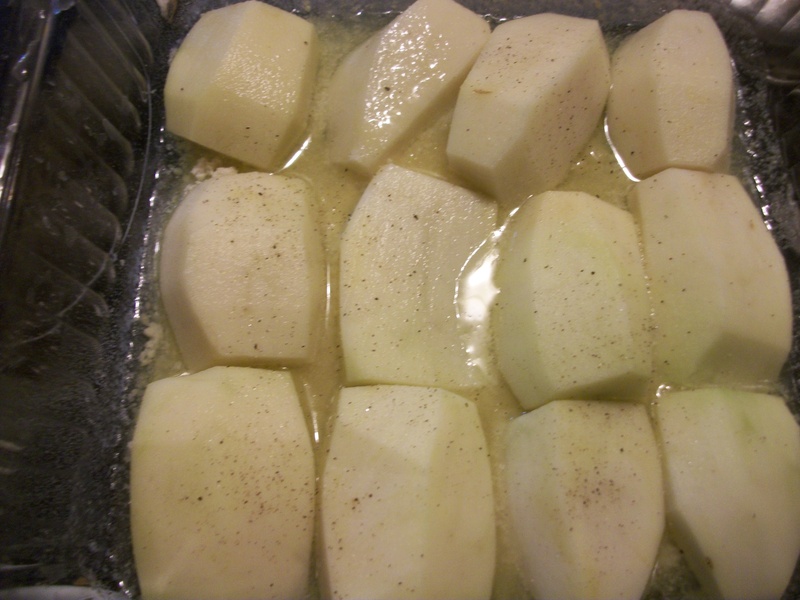 And thankfully, I had put some potatoes in the oven before the power went out…and they were the only thing done enough to eat for supper! But the boys LOVED them! And I’ll make them again (along with the rest of supper), tonight. All you need, and I had it all on hand! Everything, ready to go. So simple! Pour butter into a 9″X9″ baking pan; sprinkle cheese over butter. 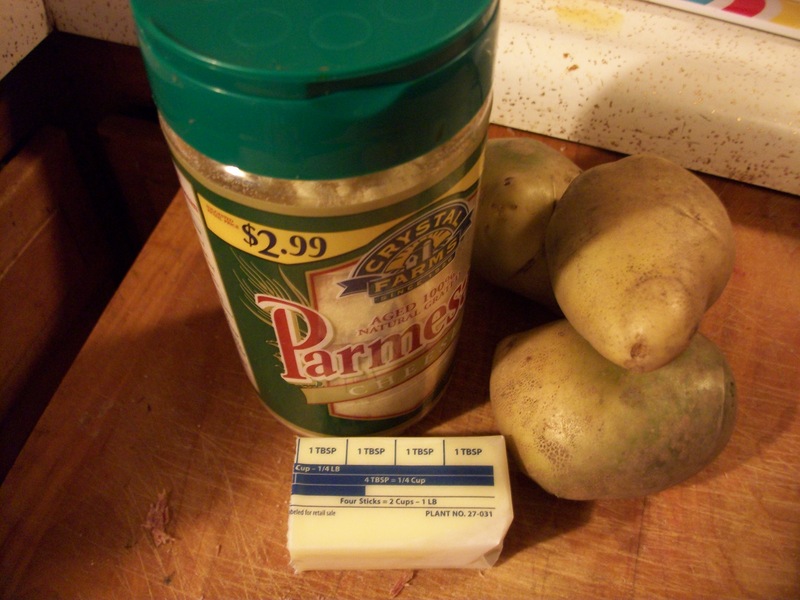 Arrange potatoes cut-side down over cheese. Bake, uncovered, at 400 degrees for 45 minutes, or until tender. Serves 4. *Notes: You can easily bump this recipe up to serve more. And it’s absolutely, wonderfully easy and delicious. My boys requested more…and were disappointed that the power was off and we couldn’t make more. But I promised more tonight, and that’s what we’ll have! 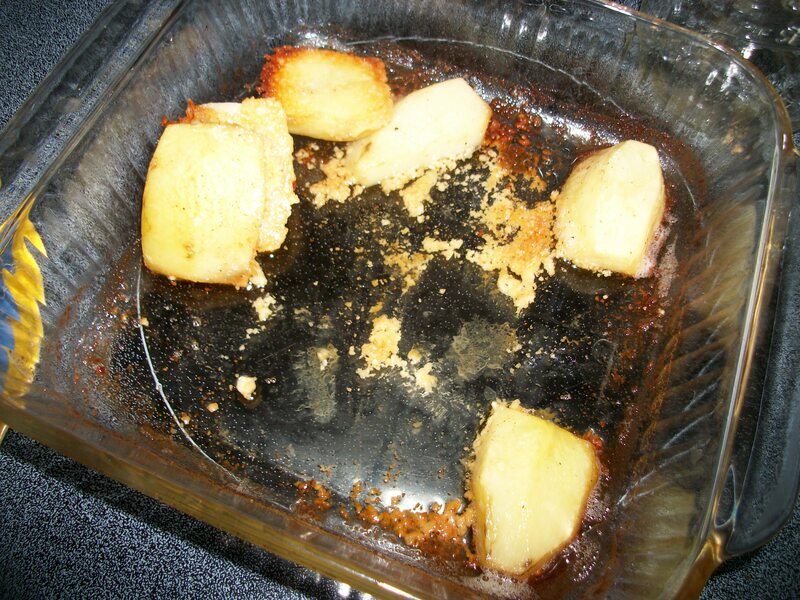 After serving each child half a potato, I thought I might have some left to taste! Cost : Are you sitting? Nothing. Nada. Zip. I had the butter and Parmesan on hand, and the potatoes were from the garden. So, it truly, truly was a “Dinner on a Dime.” Love it! Another Wordless Wednesday post from me…another story from you. As this giveaway is wrapping up, I just would like to give a heartfelt THANK YOU to everyone who has entered and has shared with us. I’ve learned so much through all of this…and I truly mean that. If I could, I would give each one of you a KitchenAid! 🙂 If you’re new to my blog, and don’t know what we’re talking about, check out this post here and sign up. 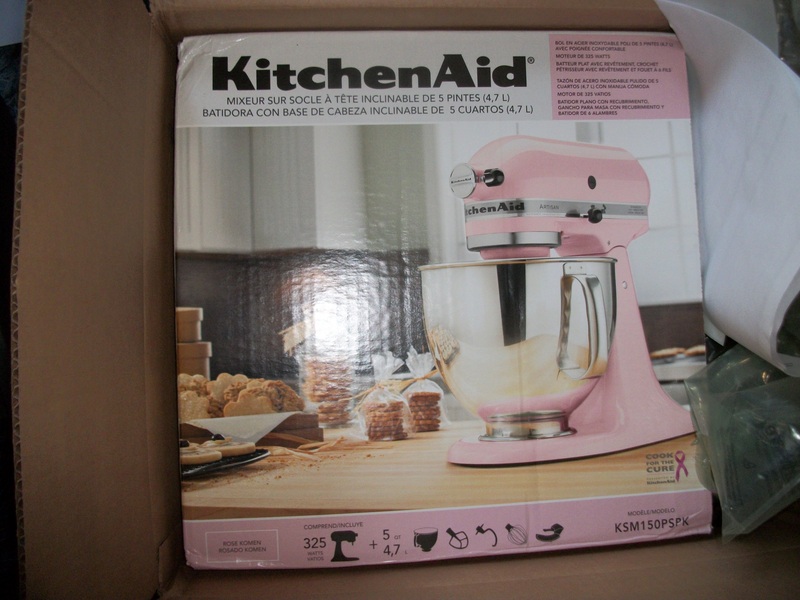 I’ll be giving away a PINK KitchenAid Artisan Stand Mixer and some accessories at noon on Monday! 🙂 Yay! I was born and raised in Southern California and I am not where I am today because my plan went the way I hoped but because of unexpected events. I’ve learned that is what life is…just a bunch of unexpected events. Nothing ever goes to plan and that can still be a very good thing. My husband and I met in 2005 and what intrigued me most about him was that he lived such a different life than what I knew. His dad was/is a sheep rancher and he grew up in the country. Unpaved roads, knowing all your neighbors, no street lights kind-of-country and here he was in the big city of Los Angeles making snow action sports films. Five years later I’m married to the small town boy, settled and adjusted in the great state of Colorado and don’t plan on moving back to California. This past August 2010 my father in law had a bad fall. He tore ligaments in his shoulder and was put in a sling until surgery could be performed. While in a sling he felt a lump in his breast. Cancer. Breast Cancer. Between the shoulder injury and chemo treatments it would be months, maybe years before he’d be able to work on the ranch again. His parents asked us if we would help out on the ranch and work to eventually take over the sheep operation. They plan to retire and enjoy life after they kicked this cancer’s a**. My husband and I always knew there was a possibility to move to the ranch but never thought it would happen this soon. Within weeks my husband and I quit our jobs, packed our things in a horse trailer and headed to SW Colorado. From all this I’ve learned that it’s not about the things you have – your house, your car, your clothes or how much money you make. Life is about what you have in your heart and the love that surrounds you. I say that and mean it 100% because I gave up quit a bit to make this move, but I gained so much more than I could have imagined in return. Yesterday, my fellow blogger and friend-across-the-miles started her second battle with cancer. I’ll be praying for her for the next few weeks/months as she boldly fights this beast called cancer. If you’d like to swing over and give her a shout, just letting her know that others are in her corner, you can leave a comment on my “Fight Like a Girl” post that you did, and be entered to win a pink KitchenAid Artisan Stand Mixer. I’ll be giving it away at the end of the month, so hurry and enter! I’m sharing another reader’s cancer story today…I’m so glad I did this. I’ve learned so much about the strength of so many women. You guys are all amazing. It makes me feel silly for worrying about some of the things I worry about. Thank you for a lesson in humility, a lesson in strength and a lesson of how to keep going. I wanted to share with you my story of my step dad that has passed away to cancer. Five years ago in May my mom married Bill. They were happy together in fact the happiest I have ever seen my mom in years. In August Bill had a swollen gland in his neck so he went to the hospital. For a couple of months the doctors told him it was allergies and put him on Zertec and antibiotics. Sept 8, 2006, Bill got up during the middle of the night to go to the bathroom and he collapsed on the floor. Blacked out and was unresponsive. My mom had called 911 and the ambulance was on their way when she had called me. They did get him to start breathing again on the way to the hospital. Several hours later the transfered him to another hospital and mom and I were on our way there too. Once there, they did a scope to look at his throat and found a cyst wrapped around his main artery and that is what caused him to black out and quit breathing. After further tests we found out it was cancer, Yes cancer not allergies. That’s when the battle began. We stayed at a house that is just a block away from the hospital and the Cancer treatment center. While Bill was in the hospital trying to get better we spent endless hours by his side (the treatments he was receiving and the lack of blood to the brain would make him hallucinate). Four weeks after he was diagnosed with cancer, he woke up one morning and asked me if I thought he was going to die and I told him no. That night mom and I went home to get clothes and so I could spend sometime with my family and we got a phone call that we needed to come back. Bill had taken a turn for the worst. We drove back that night and he did make it three more nights before he passed away. Cancer is a horrible disease to watch someone die because of it makes it even harder. To see a strong man weak and needing help getting up, going to the bathroom, and not being able to eat because the radiation burnt his throat was very hard and then to find out that the treatments didn’t help was frustrating. With cancer I think a person has every feeling possible at some point and time of treatment. I pray for all people going through cancer, their family, and their cartakers every day. It takes alot of courage and strength to get through such a horrible disease. Thank you, everyone for sharing your lives with me. Let’s keep raising awareness, and supporting others that are fighting the good fight. We need more marks in the win column. Where would we be if science wouldn’t have developed ways to fight against such horrible and devastating diseases? Where would we be without early detection and screenings available? I shudder to think. Today I share another story. Remember to check back on this post to enter for my October Breast Cancer Awareness Month pink KitchenAid artisan stand mixer giveaway! It’ll be going to a lucky reader on Oct. 31, Halloween! It says it all...Fight Like a Girl. Cancer has touched everyone’s life I think. My dad and one brother died of lung cancer. My other brother and sister in law have both had lung surgery to remove cancer. Skin cancer, breast cancer, colon cancer and more have touched my family. But my personal story is different. In January 2009 I got the call with the words, “you have a large, suspicious mass on your right ovary.” I won’t ever forget that phrase, the nurse’s inflection, the moment. That afternoon I was having a scan, and seeing my family doctor, who had been insistent I get a pelvic sonogram. He told me surgery was going to be necessary. He spent almost two hours with me, answering questions, helping me wrap my mind around this. A few days later I was sitting in a gynecological surgeon’s office. This man I’d never seen before said, “This looks bad. It has finger-like projections. You need to be operated on by someone who sees cancer every week. Not someone like me who sees it a couple of times a year.” I will always be thankful for his honesty. A couple of days after that I was seeing a gynecological oncologist – a speciality I didn’t know existed the week before. He was much more reassuring, but also very direct. “The radiology looks bad. Very bad. But your age trumps that. Ovarian cancer is very rare in women under 50.” I wasn’t as much under 50 as I would have liked for security, but it was what it was. Surgery day came and went, but there wasn’t a clear answer as expected. It was a “tumor of low malignant potential.” We thought this sounded great, until a nurse friend clued us in that could mean anything. Surgery was on a Tuesday. I was to find out on Thursday. Wednesday night the phone rang in my hospital room and it was the doctor who said, “It was benign.” Benign. What a beautiful word. I thanked him for his extra efforts to find out early for me. I thanked him for the call. And I thanked God that I had just gotten the news people are praying for every day. It was weeks later during the followup visit, when he showed me the radiology report, and explained that 7% of the tumor contained cancer cells, but they consider anything under 10% benign. My heart stopped for a moment. I realized if my family doctor had not insisted I go for a pelvic sonogram – if I had been one of the people who go for years without being diagnosed – I could have had a very different outcome. I was blessed.